If back muscles can become weak then they also become stronger. With barbell squats there’s no other exercise that can match it’s effectiveness for a total lower back and buttock strengthening workout. 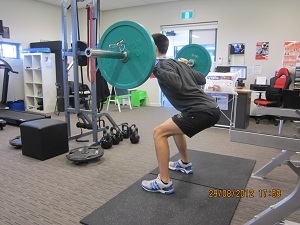 Squats are excellent for back weakness issues when performed correctly and under the supervision of an exercise professional from Peak body at Perth Sports Injury Clinic. 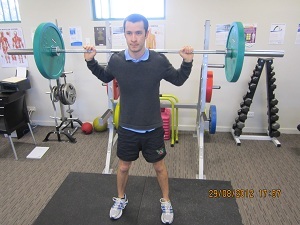 Step 1- Stand with feet at about shoulder width and have the toes pointing slightly out. Step 2- Lower your body as if you are trying to sit on a chair. Make sure you keep the head up and chest out. Lower your body until the upper legs are parallel with the ground. 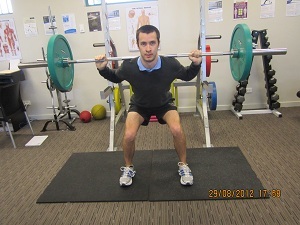 Step 3- Return to the starting position while maintaining correct posture.